iOS 11 comes with some extra built-in augmented reality tricks thanks to a developer package called ARKit - it means the camera in your iPhone (or iPad) can instantly layer digital graphics on top of real world scenes in ways that look seamless and natural. As long as you've got iOS 11 installed and an iPhone SE, an iPhone 6 or newer, an iPod touch sixth generation or newer, an iPad mini 4 or newer, an iPad Air, or an iPad Pro, you can explore the magic of ARKit: and these are some of the best apps to use it so far. To be honest, we'll do anything to avoid a trip to Ikea, and the ARKit-enabled Ikea Place (free) could be just the ticket: it lets you visualise furniture from Sweden in your own home, letting you imagine all kinds of layouts and colour schemes through your iPhone. That means you don't have to spend ages trailing round the nearest Ikea warehouse or returning furniture when it doesn't match the artwork on your walls, and thanks to the power of AR you can walk right up to and around your virtual items after placing them. Let your creative talents run wild through augmented reality with Paint Space AR (free). As the name suggests, it lets you digitally daub the environment that surrounds you with scribbles, pictures and more, and then send the end results to your pals on social media. It's not the most advanced art app of all time, but it does show off the way ARKit can get digital elements on your screen meshing seamlessly with whatever your phone camera is pointing at, whether you want to graffiti walls or annotate your freshly cooked breakfast. Let's get educational for a moment with Complete Anatomy (freemium, iPad only) - it gives you an incredibly detailed look at the human body, and with added ARKit goodness, you can have organs and bones and everything else floating around in the room in front of you. Besides the augmented reality trickery, this is a very comprehensive look at our anatomy, with well-crafted visuals and accompanying notes written by experts in the field. Whether you're studying biology or just really interested in it, Complete Anatomy is worth getting. As yet there aren't a huge number of entertaining games making use of ARKit, but Stack AR (freemium) is worth a look - okay it's nothing too clever, but it shows how augmented reality adds to the gameplay experience as you stack up blocks on a surface in front of you. The graphics are nicely done and you can build your towers anywhere from a coffee table to a beach. As the months go by, you can expect to see more complex gaming titles appear in the App Store, but for now Stack AR is a good start if you're interested in AR's potential. Also from the world of mobile gaming, Euclidean Lands (£3.99 or $3.99) was a very competent puzzler in its own right before iOS 11 and ARKit came along, but now it has some added AR smarts, so you can work your way through the twisting, blocky levels in augmented reality. Judging perspectives and distances is crucial to making progress, and the game has just enough to variety to keep the challenge interesting. Take it on the go with you and you can have whatever background you want, from the office canteen to your back garden. Augmented reality apps can be practical as well as entertaining, as TapMeasure (free) proves: it might not be the most extravagant AR app you ever install, but it sure is useful, letting you measure out any room accurately with a few taps on the screen of your device. On top of measuring existing rooms you can also build new 3D rooms from scratch and walk around them - handy if you're planning an extension or a new garden shed. 3D models can be easily exported and there's a smart AR level included in the app as well. 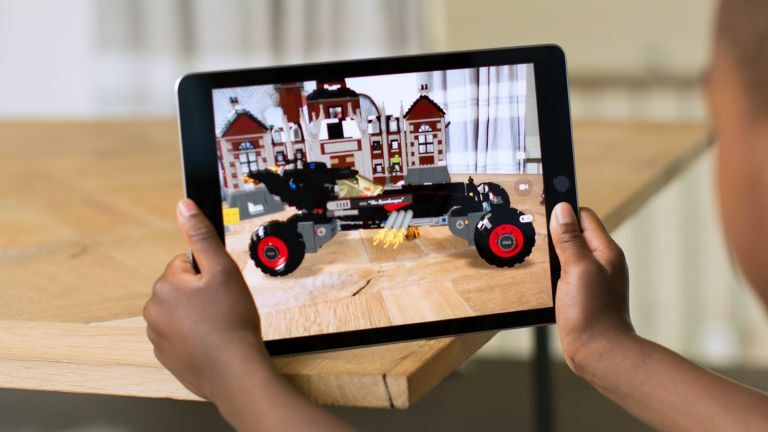 One for the youngsters, and the young at heart, Thomas and Friends (freemium) lets you lay out a cartoon train track on your living room floor, or your study desk, or wherever else you want Thomas the Tank Engine to travel, thanks to the addition of some ARKit magic. The app has previously been featured by Apple as one of the best examples of what augmented reality can do, and if you don't want to use the AR elements then you can build the railway tracks of your dreams in a more conventional digital environment as well.